He's a unique horse: big, beautiful, brave, clever, calculating, always getting in trouble (and hates to get caught and yelled at), very sensitive - his feelings and under saddle. He'll closely watch you unlatch or unhook a gate, and spend hours or days working at it himself - and he'll eventually get it open. He went down to roll once and got two of his legs through a chicken wire fence (okay... so that wasn't so smart), and he laid there not panicking while four of us helped get him out. 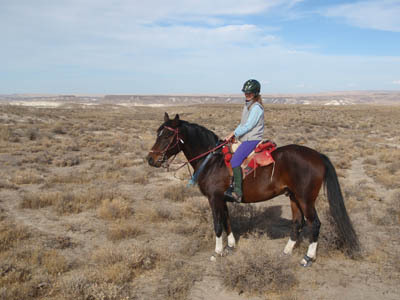 He can help herd cattle without a rider. He likes to get out on the trails and ride. And yet, get him out on the trail in front, and he can be the biggest spooker, the biggest chicken (just ask that jackrabbit we met only a quarter-mile down the trail this morning). 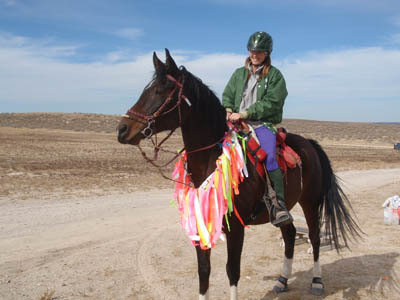 And so today I put a hula skirt of ribbons around his neck, for marking trail. "Now that's a broke horse!" Andy said, as he came by on a spooking bucking horse on a wild ride of his own. Well, now, I thought, is Dudley broke for this? It was breezy. There were a lot of ribbons around his neck, and if he started panicking then bucking, there would be no stopping him, ever. I walked Dudley around with his ribbon hula skirt, then I lunged him in a circle around me. The ribbons flapped in the wind. They danced in the breeze, swishing like a hula skirt. Spooky? Jumpy? Bucky? Hardly. Dudley thought he was awesomely handsome (which he was), and the more the flags fluttered, the taller he posed. 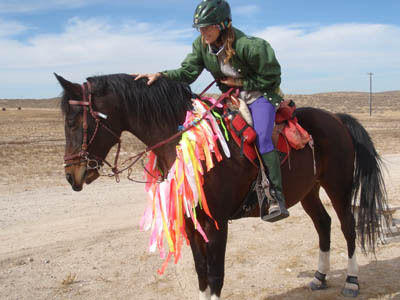 He positively sashayed to make the ribbons sway more. 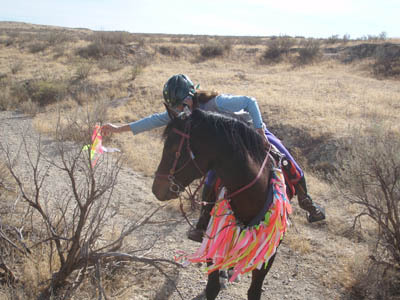 That horse posed with his ribbon hula skirt like a movie star. 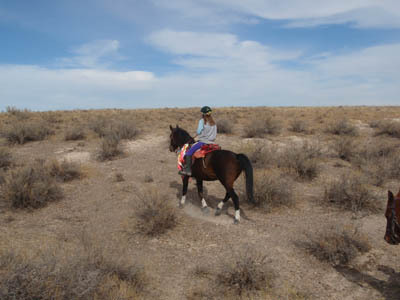 And so we went, marking the Utter Disaster Trail with Regina and Michelle for the Owyhee Hallowed Weenies Endurance Ride, on October 30-31 (costumes are highly recommended on Halloween!). Dudley is very good at putting ribbons out. When I pulled a ribbon off his skirt, he was even anticipating the bushes I was going to pin it on. He was good at supervising too. 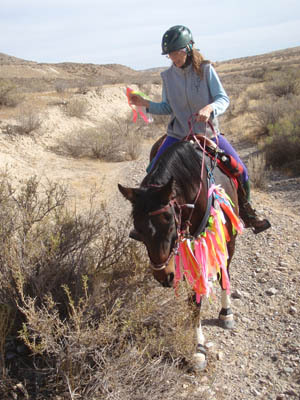 When the last ribbon was gone from Dudley's hula skirt, he looked like just another handsome horse on the prairie.